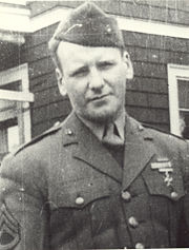 Gunnery Sergeant William Gary Walsh (7 April 1922 - 27 February 1945) was a U.S. Marine who was posthumously awarded the U.S. military's highest award for valor, the Medal of Honor, for his heroic actions during the Battle of Iwo Jima in World War II. William Gary Walsh was born on 7 April 1922 in Roxbury, MA. He attended public schools in Boston before enlisting in the U.S. Marine Corps in April 1942. He received his basic training at the Marine Corps Recruit Depot, Parris Island, SC, and advanced training at Camp Lejeune, NC. From Camp Lejeune, he went to Samoa and was assigned to a unit of Marine scouts. His next assignment was with the famed Carlson's Raiders. During the U.S. war with Japan in the Pacific, he saw action at Guadalcanal, Bougainville, Tarawa, and in the Russell Islands. Following two years of service in the Pacific theatre, he returned to the U.S. He returned overseas later with the 5th Marine Division in time for the Iwo Jima invasion. It was at Iwo Jima, while leading his men against a fortified hill on 27 February 1945, he threw himself on a hand grenade, sacrificing his life to save the lives of fellow Marines. For this heroic act, he was posthumously awarded the Medal of Honor. 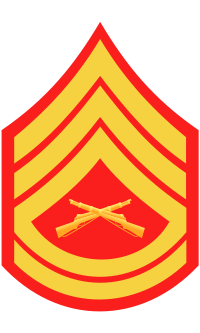 Rank and organization: Gunnery Sergeant, U.S. Marine Corps Reserve. Gunnery Sergeant William Gary Walsh was killed in action on 27 February 1945. Initially buried at the 5th Marine Division Cemetery on Iwo Jima, Walsh's remains were later returned to the U.S. and re-interred at Arlington National Cemetery, Arlington, VA, on 20 April 1948. His grave is located in Section 12, Grave 487.